* Blundell’s, nr. Warrington, Cheshire. Sat, 30. Kieron Rich (Daiwa) 46-5-0, ide to 2 lb, mirrors and F1s, maggot, 11m, peg 55; Mark Lucas (Mosella) 41-2-0; Gary Whalley (Bait-Tech) 35-14-0; Jack Howarth (Mosella) 32-2-0. * Brookside, Snake Pit, Cheshire. Sun, 31. Nick Butterworth (Cheshire Angling) 34-10-0, F1s and silvers, pellet, 14m, peg 5; Tom Barlow (Maver NW) 26-0-0; Trevor Dewhurst (Premier Driveways) 22-2-0; Jamie Hughes (Ted Carter Southport) 20-2-0; Steve Conroy (Drennan NW) 20-0-0; Jimmy Wilson (JW Pole Repairs) 18-2-0. * Crewe & District WL, Trent & Mersey Canal, Nantwich, Cheshire. Sun, 36. Lewis Kenyon (Betley’s Monsters) 6-9-0, mainly roach, whip with caster, hemp and squatt, pegged near dog bin at top end of the belt; Keith Hulland (Team Eclipse Green) 5-14-8; Stef Johansen (Team Eclipse Green) 4-11-12; Jeff Shaw (Team Guinness) 4-6-8; Martin Griffiths (Team Guinness) 4-1-8; Tony Keeling (Team Eclipse Blue) 4-0-1. Teams: Team Guinness 30; Team Eclipse Green 27; Browning Lifestyle 22; Betley’s Monsters 20; Cheshire MG 20; Team Les ‘O’ 19.League: Team Guinness 53; Team Eclipse Green 49; Team Les ‘O’ 45; Browning Lifestyle 44; Betley’s Monsters 39; Wyche 39. Heronbrook Fisheries, Slindon, Staffs. Sat, 39, Meadow, Canal and Island pools. Dave Childs (Rugeley) 83-8-0, carp to 7 lb, poled red maggot, Meadow peg 27; Clive Wynn (Wrexham) 71-2-0; C. O’Connor (Congleton) 59-10-0; Lee Thornton (Middy/Bag’em) 56-12-0; A. Davies (Heronbrook) 43-14-0; Graham Thomas (Wrexham) 43-12-0. * Heronbrook Fisheries Ind WL, Slindon, Eccleshall, Staffs. Sun, 77, all pools. Jordon Hall (Maver Midlands/Bag’em) 78-14-0, two carp and 35 F1s, maggot at 6m, Canal peg 33; Steve Williamson (Reddish AC) 62-0-0; Ade Shepherd (Heronbrook) 58-0-0; Jez Goldthorpe (Matrix Stapeley) 55-0-0; Lee Thornton (Middy/Bag’em) 54-8-0; Craig Goldstraw (Maver Midlands/Bag’em) 45-3-0. League: Matt Barwell (Maver Gold/Bag’em) 4; Ken Oldham (Connect Tackle) and Lee Thornton (Middy/Bag’em) both 5. * Northwich Mini League, River Weaver, Cheshire. Sat, 41. Reg Evans (Atomic Baits) 12-3-0, bream, red maggot, bread feeder, pegged on dredger length; Danny Sixsmith (Ballyforce) 8-4-0; Andy Insley (Bream Team) 5-10-0; Keith Rustage (C-Bs) 5-2-0. Teams: Atomic Bait 13-6-0; Ballyforce 10-11-0; Bream Team 8-7-0. League: Ballyforce 11; Atomic Bait 18; Ted Carter Southport and Cheadle both 26. * Partridge Lakes, Culcheth, Cheshire. Sat, 31, Covey. David Rigby (St. Helens Tackle & Bait) 39-12-0, F1s, maggot, 11m, peg 131; Mick Threlsall (Partridge Lakes) 21-2-0; Dave Ebbroll (Ashton Angling) 19-13; Simon Fadden (Kieron Rich.com) 19-13-0. Sat, WL, 50. Wayne Nolan (Brabhams) 58-1-0, F1s, maggot, 8m, peg 2 Spey; Colin Scott (Garbolino Elton) 57-6-0; Andy Geldart (Brabhams) 47-10-0; Richard O’Connor (Drennan NW) 47-7-0; Keith Dixon (North West Baits) 39-7-0; Richard Crabtree (Partridge Lakes) 38-6-0. Teams: Garbolino Elton 14; Mike Reed (Garbolino Elton) 17; Horse 20. League: Garbolino Elton 127; Drennan NW 153; Guru, Mike Reed and Garbolino Elton all 170. Sun, 35, Covey. Kerry Kirkwood (Partridge Lakes) 24-6-0, F1 carp, maggot, 8m, peg 42; Ian Bentham (Leigh Tackle & Bait) 22-8-0; Brian Conroy (Warrington Tackle & Gun) 18-5-0; Peter Tickle (St. Helens Tackle & Bait) 16-4-0. Blundell’s, nr. Warrington, Cheshire. Wed, 19. Kieron Rich (Daiwa) 76-4-0, F1s, mirrors and ghost carp, pellet, 14m, peg 35 Trio; Jamie Hughes (Maver) 73-7-0; Simon Fadden (Frenzee) 52-2-0; Dave Simpson (Home Guard AC) 37-3-0. Sun, 17. Dean Edwards (Fisherman’s Way) 29-3-0, skimmers to 2 lb and F1s to 3 lb, pellet, 5m, peg 5 East; Jack Howarth (Mosella) 25-13-0; Dave Williams (Fisherman’s Way) 15-0-0; Dave Williams (Cheshire Angling) 14-4-0. Brookside, Snake Pit, Cheshire. Thurs, 17. Tom Barlow (Maver NW) 32-2-0, F1s and silvers, bread and pellet, 12m, peg 4; David Williams (Garbolino Elton) 28-8-0; John Lyth (Brookside) 26-14-0; Nick Butterworth (Cheshire Angling) 24-0-0; Mark Lucas (Mosella) 22-4-0; Jamie Hughes (Ted Carter Southport) 22-0-0. Sat, 25. John Battersby (Garbolino Elton) 26-12-0, F1s, pellet, 12m, peg 59; Nick Butterworth (Cheshire Angling) 26-0-0; Mark Plevin (Deggy’s Tackle) 20-4-0; Paul Casson (Cheshire) 17-2-0; Chris Ruscoe (Rod n Reel) 16-8-0; Ross Whiteman (Cheshire Angling) 15-14-0. Cudmore Fisheries, Whitmore, Staffs. Sat, 20, Suez & Panama canals. Gareth Gibbons (Protak Barlows) 89-10-0, carp to 4 lb, chub and ide, pellet at 13m, Panama peg 3; Mel Kearns (Cudmore Gold) 67-8-0; Carl Lane (Prescott Angling Centre) 53-8-0; Shaun Hill (Maver Gold Bag’em) 41-4-0; Simon Jones (Trentham Lakes) 41-4-0; Andy May (MAP/Bait Tech) 33-8-0. Sun, 15, Panama Canal. John Glover Jnr. (Cudmore Gold) 62-8-0, carp to 4 lb, ide and chub, poled maggot, peg 2; Gary Kirby (Cudmore Gold) 49-8-0; Adrian Wood (Hazel Grove) 32-12-0; Mark Reynolds (Hazel Grove) 32-4-0. Firswood Road, Latham, Skelmersdale, Lancs. Wed, 19. Paul Mossman (Tri-Cast Highfield) 54-12-0, carp to 4 lb, pellet, 10m, peg 17; Roy Jones (St. Helens) 48-6-0; Lewis Carol (Firswood) 36-12-0; Colin Taylor (Mersey Dockers) 28-10-0. Sat, 16. Ben Nubury (Tri-Cast Highfield) 69-10-0, F1s and mirror carp, 4mm pellet, 8m pole, peg 8a; Mark Halliwell (Bag’em) 66-1-0; Jay Declued (Ted Carter Southport) 53-12-0; Frank Cooke snr (Ray’s Tackle) 38-10-0. Hanchurch Fisheries, Stoke-On-Trent, Staffs. Sun, 16, Model Canal. Dave Parry (Hanchurch Fisheries) 40-0-0, carp, poled pellet, peg 10; John Stevens (Ball Green WM AC) 31-15-0; A. Holmes (Hanchurch Fisheries) 30-2-0. Liverpool DAA, Leeds Liverpool Canal, Legion and Shop Lane, Liverpool. Sun, 22. Dave Trafford (Wigan MG) 5-6-0, roach, punch bread, pole 6m, peg 430; John Easton (LAS) and Gary Marchant (Ted Carter Southport) both 4-10-0; Mike Dixon (Liverpool Dockers) 4-7-0; Dave Massey (Wigan MG) 4-7-0. Meadow View, Lark Pool, Cheshire. Tues, 16, OAPs. Steve Leaf (Sale XL) 24-8-0, carp to 6 lb, corn and pellet, 14m, peg 2; Paul Ledgerton (Meadow View) 16-10-0; Ray Ignett (Shaw’s Tackle) 15-8-0. Thurs, 15, Thrush Pool. Steve Leaf (Sale XL) 20-4-0, carp to 3 lb, maggot and pellet, 6m, peg 3; George Osborne (Shaw’s Tackle) 16-6-0; Eric Whitely (Danny’s Tackle) 12-12-0. Sun, 18, Lark. Phil Barwell (Widnes AC) 77-8-0, carp to 10 lb, pellet and corn, Method feeder, peg 6; Barry Davis (Deeside Tackle) 44-0-0; Keith Marsden (Meadow View) 37-12-0. Newton-le-Willows AA, Cow Hay Dam, Lancs. Thurs, 20. Danny Sixsmith (Sixsmith Pole Repairs) 11-8-0, skimmers and roach, caster, 8m pole, peg 18; Eddie Cook (Warrington) 8-0-0; Steve Rimmer (St. Helens Tackle & Bait) 7-5-0. Old Hough, Warmingham, Cheshire. Tues, 13, Boulders Pool. Bob Meggs (Northwich) 19-13-0, small carp and silvers, poled pellet; Phil Cliffe Snr. (Old Hough) 14-8-0; Ian Mason (Old Hough) 10-9-0; John Pearson (Old Hough) 10-2-0; Lewis Breeze (Drennan NW) 9-2-0. Thurs, 8, Upper Benbo. Dave Holland (Tri-Cast Highfield) 32-4-0, small carp and silvers, poled pellet and maggot; Adam Jones (Old Hough) 17-5-0; Ben Clarke (Old Hough) 10-8-0; James Cantello (Tri-Cast Highfield) 9-0-0. Sat, 11 Big Max. Pete Johnson (Old Hough) 35-14-0, small carp and silvers, poled pellet and maggot; James Cantello (Tri-Cast Highfield) 19-9-0; Martin Grindey (Old Hough) 18-15-0; Bob Asher (Old Hough) 17-4-0. Partridge Lakes, Culcheth, Cheshire. Mon, 25, OAPs. Spey, Marsh & Ribbon lakes. Ronald Kinsella (Widnes AC) 39-7-0, F1 carp, pellet, 6m, peg 5 Marsh; Alan Talbot (Dave’s Wigan) 19-7-0; Ernie Melling (Harry’s Tackle) 18-15-0; Keith Wilson (Partridge Lakes) 18-14-0. Tues, 26. Kerry Kirkwood (Trafford) 53-12-0, F1 carp, maggot, 6m, peg 100; Mike Rogerson (Drennan NW) 43-10-0; Andy Bennett (Daiwa Guru/Bait-Tech) 42-0-0; Keith Mahoney (Dino Floats) 33-0-0. Wed, 40, Covey. 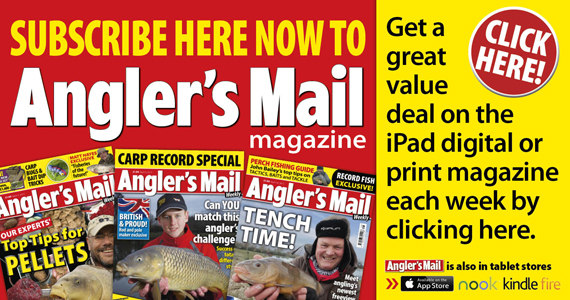 Tommy Aspinall (Atherton Tackle) 37-3-0, F1s, pellet, 10m, bridge peg 50; Dave Olly (Olly Motors) 34-1-0; Albert Grimes (Partridge Lakes) 23-6-0; Phil Oaks (Garswood Hall) 21-10-0; Denis Ockwell (Leigh Tackle & Bait) 19-5-0; Walter Elmore (Partridge Lakes) 19-0-0. Thurs, 30, Covey. Peter Tickle (St. Helens Tackle & Bait) 48-8-0, F1s and common carp, maggot, 11m, peg 2; Mike Dench (Let’s Tackle) 48-4-0; Dave Machin (Stalybridge Angling) 43-3-0; Steve Eckersall (Farnworth Tackle & Bait) 42-10-0. St. Helens AA, Carr Mill Dam, Merseyside. Mon, 16. Kevin Hall (Newton-le- Willows) 10-0-0, bream and skimmers, maggot, Method feeder, peg 157; Brian Cross (St. Helens) 6-12-0; Lee Addy (Drennan/Bait-Tech) 6-0-0; Paul Cliburn (Wigan) 5-6-0. Sun, 18. Mark Tallon (Farnworth Tackle & Bait) 26-6-0, bream and skimmers, boilie, Method feeder, peg 89; Simon Stott (Farnworth Tackle & Bait) 11-3-0; Les Hayes (St. Helens ) 8-5-0; Mick Lever (St. Helens Tackle & Bait) 7-9-0. St. Helens Tackle & Bait WL, Partridge Lakes, Cheshire. Sun, 80 (non-MOTY points due to placing anglers). Simon Beswick (Partridge Black) 50-13-0, F1s, pellet, 8m, peg 8 Willow; Peter Tickle (St. Helens Tackle & Bait a) 41-14-0; Keith Dixon (St. Helens Tackle & Bait) 41-7-0; Matthew Golding (Matts Dodgers) 40-10-0; Mike Reed (Garbolino Elton/Wayne’s Tackle) 37-11-0; Anthony Jones (Joneys) 37-4-0. Teams: Patricroft 10; St. Helens Tackle & Bait 14; Wayne’s Tackle 14; Partridge Black and Misfits both 15. League: Leigh Tackle & Bait 27; St Helens Tackle & Bait 28; Partridge Black 30; Wayne’s Tackle 32. Wigan DAA, Leeds-Liverpool Canal, Addlington, Lancs. Wed, 30. Dave Bradley (Maver NW) 8-5-12, roach to 6 oz and skimmers, bread punch and worm, 6 and 13m, pegged at White Bear Marina; Dave Wells (Tri-Cast Rochdale) 6-4-0; Alan Crook (Maver NW) 5-10-8; Darren Price (Tri-Cast Rochdale) 5-0-4. Sat, 20, Burscough. 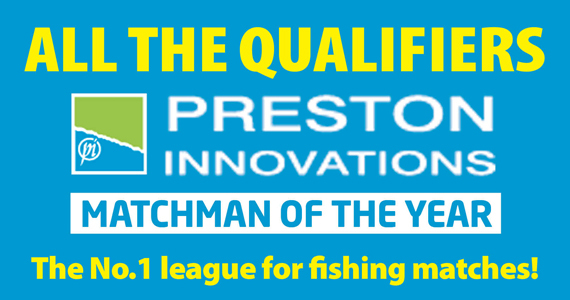 Dave Trafford (Ted Carter Preston) 4-14-0, skimmers and roach, bread punch, 6 and 11m, pegged near slipway; John Leeds (Tri-Cast Rochdale) 4-6-0; Carl Whalley (Sensas NW) 4-4-4; Steve Wilson (Ted Carter Preston) 3-5-4.